Offer thanks to the Lord for bringing this new policy forward for all citizens! 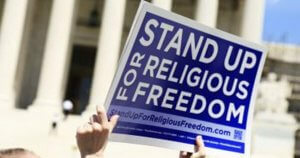 The protection of religious freedom is vital to maintaining a healthy republic. Pray into some of the religious freedom advances of this Trump Administration–download our Special Report Prayer Guide HERE. The U.S. Department of Labor’s Office of Federal Contract Compliance Programs (OFCCP) announced a new policy directive on Friday which focused on protecting religious freedom. The directive instructs OFCCP staff – in all their activities – to take into account recent U.S. Supreme Court decisions and White House executive orders that protect religious freedom. The Supreme Court issued rulings in 2014, 2017 and 2018 that safeguard the broad freedoms and anti-discrimination protections that must be afforded religion-exercising organizations and individuals under the U.S. Constitution and federal law. The directive refers to cases such as Burwell v. Hobby Lobby Stores, Inc., Trinity Lutheran Church v. Pauley and Masterpiece Cakeshop, Ltd. v. Colorado Civil Rights Commission, all in which Liberty Counsel filed amicus briefs at the High Court. Additionally, President Donald J. Trump has issued executive orders reinforcing the administration’s commitment to robust protections for religious freedom, as well as ensuring a level playing field for faith-based organizations to compete for federal grants, contracts, programs and other funding opportunities. Does this apply to our troops & chaplains too? I agree to this law.